Epic Recs is hosted by Judith at Paper Riot and Amber at Books of Amber. It's where you pair up with a reader friend and recommend (*cough*force*cough*) a book to them. As Judith says, it's like truth or dare without the truth. I'm pairing up with my brain twin Molli from Books and Whimsy. We’re always recommending books to each other but rarely actually read them for whatever reason. We’ve made a goal/promise to ourselves and each other to read more ‘me’ books in 2014. We both got bogged down with review books in 2013 and need to get back to reading more for pleasure, so we thought Epic Recs would help...plus then we don't have to constantly listen to each other saying "Read this book. When are you going to read this book? Have you read this book yet?" In January, Molli made me read If You Find Me by Emily Murdoch, and I made her read Amy and Roger's Epic Detour by Morgan Matson. And? Our first month was a huge success. We both loved the books the other recommended...so much so that we each gave them 5 stars. See? Brain twins. Neither of us has posted our reviews yet, but be on the lookout for them soon. For February, Molli is making me read Before I Fall by Lauren Oliver (because she likes to make me cry), and I'm making her read Scarlet by AC Gaughen (because it's one of the BEST BOOKS EVER). I read Before I Fall in 2012, and while I loved the second half, I didn't like the first half at all. It's definitely worth reading though. 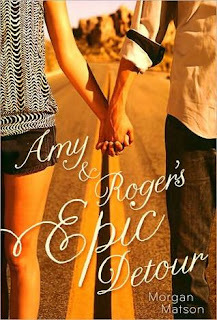 Amy & Roger's Epic Detour is awesome!!! I'm so glad you loved it. :) Before I Fall is really good, too. I love Lauren Oliver's writing. I haven't read Scarlet but I hope to at some point ... it looks really good! I really liked Amy & Roger's Epic Detour, and I've been wanting to read Scarlet for ages! I'm going to have to keep an eye on your blog for other recommends! Great idea! I haven't read either of the January books but I definitely agree with you about Scarlet. SO good. I can't wait to read Lady Thief. Scarlet IS one of the best books ever!! :) I read it b/c of your review last year and absolutely loved it.